Where can you stream Fresh Off the Boat? On 2015-02-04 Comedy TV Series Fresh Off the Boat first aired on ABC. 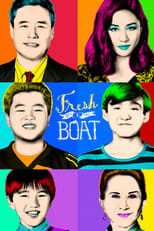 Written and created by Nahnatchka Khan, and produced by The Detective Agency & 20th Century Fox Television, Fresh Off the Boat will return and was last broadcasted on 2019-04-12.